Self-Compacting Concrete: Materials, Properties and Applications presents the latest research on various aspects of self-compacting concrete, including test methods, rheology, strength and durability properties, SCC properties at elevated temperature, SC manufacturing with the use of SCMs, recycled aggregates and industrial by-products. 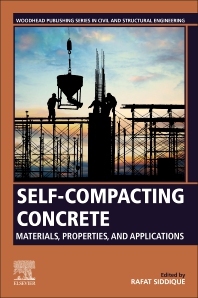 Written by an international group of contributors who are closely associated with the development of self-compacting concrete, the book explores the main differences between SCC and normal concrete in terms of raw materials, fresh properties and hardened properties. Other topics discussed include the structure and practical applications of fiber reinforced SCC. Researchers and experienced engineers will find this reference to be a systematic source to SCC with its accounting of the latest breakthroughs in the field and discussions of SCC constructability, structural integrity, improved flows into complex forms, and superior strength and durability. Rafat Siddique is Dean of Research & Sponsored Projects & Senior Professor of Civil Engineering & Former Dean of Faculty Affairs at the Thapar Institute of Engineering & Technology (Deemed University), Patiala, India. He received his doctorate in 1993 from BITS Pilani, in India and his Post-doctoral Fellowship from the University of Wisconsin-Milwaukee, USA. The major thrust of his research is the Utilization of Waste Materials and Industrial By-products in Construction Materials and Supplementary Cementing Materials. He is the author of over 230 research articles in peer-reviewed journals and conferences. He has published four books including two by Springer on Waste Materials and By-products and Supplementary Cementing Materials. He is the Editor of the Journal of Construction and Building Materials (Elsevier). He is also an Associate Editor of the Journal of Materials in Civil Engineering (ASCE) and Journal of Sustainable Cement-Based Materials (Taylor & Francis) for five years (2012-2017).. He has been a visiting/invited Professor to a number of Universities in France, Germany, Finland, UK, USA, and Mexico, Thailand and Australia. He has been rated amongst top 10 researchers in concrete technology by Google Scholar with Citations of 8000+ having H-Factor of 47..